“You’ve got to see something,” my husband said, right after picking our eleven-month-old daughter and me up at the San Francisco airport. We had left Paris on December 22, more than twenty hours ago, and I wondered what could a Parisian have never seen that couldn’t wait until the next day. But an irresistible hint of excitement in my husband’s voice triggered my curiosity. “Where are you taking me?” I asked. “Get ready,” he said with a twinkle in his eyes. We drove through Palo Alto for another half hour. Although there were almost no cars and absolutely no one in the streets, every house was lit up with tiny white bulbs that looked like icicles. Plastic Santa Clauses and snowmen, reindeer and sleighs made out of wire stood in almost every front yard. Many tree trunks were wrapped with electric garlands, which were also lit up. I had never been to Disneyland, but I imagined that it looked like that. Magical. My sister had taken me to the Champs-Elysées the night before my departure. Paris was dressed up for the holidays, and as my sister drove down the glamorous avenue, I took in the trees covered with artificial snow and the strings of lights draped above the Arc de Triomphe. The decorated and illuminated houses on Emerson, University, and most streets in Palo Alto offered a new version of the holiday season. Nowhere in France in 1990, could you see so many lights, so many decorations, not even in Paris. And no French person would have put on such a show in her own front yard. Here in California the over-the-top attitude outshone the restrained French one. That night, under the California starred sky, I fell for the American exuberant nature, and yet in the back of my head the French nagging voice of reason tsks tsks its tongue. Isn’t a little too much? In the center of our new living room, a Christmas tree spread its branches. “It was the smallest one,” my husband said. Like any Parisian, my husband hadn’t thought of a Christmas tree before he saw them vanishing from parking lots like French baguettes fly from the bakers’ racks at dinner time. In France, many people get their Christmas tree at the last minute, often decorating before the messe de minuit or midnight mass. Compared to the French sapins de Noël, our first American Christmas tree was a giant. Some in France are small enough to be carried home without a car. Yet from an American perspective, our tree was the runt of the litter and the smallest we would ever get. My husband switched the string of lights on. The tree came alive under my eyes, but without glimmering balls and a star at the top it looked bare, and the thought of spending, for the first time ever, Christmas away from my family filled me with emotions I had never experienced either. In a confuse way I knew that I was missing France as much as the people I knew there. I had seen very little of California, but the sense of displacement was palpable. On Christmas Eve I tucked the gifts, which our parents had slid into my suitcase, in our shoes set under the tree as in France. Only the huge, colorful plastic house that my husband bought at Toys “R” us didn’t fit inside our little girl’s pair of baby shoes. When she discovered the house on Christmas Day, she clapped her hands and crawled inside. She opened and closed the shutters of the two windows before shutting them for good. Had she already understood that she would need to carve out her own space between two immigrant parents? This first Christmas gift would, for years, remain her favorite hideout. Away from our friends and family, this first American Christmas was low key in comparison to the American extravaganza around us. Our search for a small turkey, a French Christmas tradition, was a challenge. In retrospect, we shouldn’t have embarked on such a quest. In a country that craves big, we could only fail. I threw the leftover turkey away after a week of eating it cold with mayonnaise, Dijon mustard, and pickles that had nothing to do with French cornichons. On that first Christmas we also searched for marrons, French chestnuts that we cook and serve around the turkey. “It should do,” my husband said when he discovered a can of Chinese water chestnuts. It did, even though they had absolutely nothing in common with French chestnuts. Despite our personal quiet Christmas, the overall effervescence proved to me that Americans took the holiday season even more seriously than the French cherish their summer paid vacation. All over town, women wore red sweatshirts, sometimes embroidered with reindeer and snowflakes. They also pinned candy cane brooches on their lapels while others – men included – wore Santa Claus hats. Some people attached bells to the pompon. Christmas carols played everywhere. And everyone wished everyone Happy Holidays. Even the Palo Alto police officers did the same. I suddenly understood what the immigration officer said after he handed me back my passport. His voice calling after me had stopped me in my tracks. I turned and he said, “Happy Holidays!” My baby girl waved cheerfully her small chubby hand, while I shrugged hesitantly one shoulder. We weren’t going on a holiday but were on our way to our new American life. 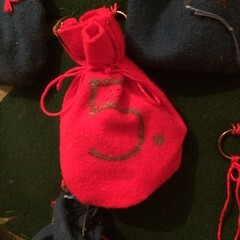 Next Advent Calendar Day 6: Nikolaus I Still Believe! A wonderful post, Evelyne, rich and alive with detail, love and wonder. Thank you. Gulura. I appreciate your time reading this post and commenting. Happy Holidays to you and your loved ones. This is amazing! Having grown up in America society and been accustomed to the social norms of holiday time since I could talk, it’s fascinating to see my culture from another’s perspective. You have a good point about the way foreigners see what is normal to natives with a different eye. Yes, many years later, my family celebrates in a more American way, although we’ve kept a few very French things, such as putting shoes under the tree. But we also have the big red stockings hung on the mantel! Sometimes mixing cultures adds a bonus. Thank you, Melanie for reading this post and thank you, Solveig for inviting me over. You are welcome Evelyne! It is a pleasure to have you share your story! I have the Christmas letter my family wrote the first year in the US, back then I was 12 and was all shocked by the overly decorated houses etc. when three years later we arrived in France, it was all bleak. We were accustomed to the American Christmas extravaganza! Solveig invited me to contribute to her Advent Calendar event. I wrote about my first American Christmas in California, only three days after I had left Paris with my baby daughter. Although many years have passed and I am now celebrating the holidays in a very American way, I won’t forget this very first Christmas. The photos were not taken in Palo Alto in 1990 but a couple of years ago when I visited Christmas Tree Lane in Fresno, CA, one of the most stunning holiday displays in the country. I wish you all a Peaceful and Loving Holiday Season. Wonderful post. Of course, you came to an area of our country that is extravagant about everything, mostly because they have the pocketbook to match the extravagance. Palo Alto is not the norm, not even for California. Had you driven eat if 101, you would have come to East Palo Alto where the humble homes are often so sad that it would bring years to your eyes. That area is completely opposite, socio economically and ethnically, from anything west of the freeway. Thanks for that insight Corina. When you’ve never been to these places, it’s helpful to have a few different perspectives to get a balanced view. We are very electric about Christmas in the U.S. We believe nothing says “Christmas” like a few million watts of lights … 🙂 Glad to have you on our shores! In some respects, it would be like landing in a parallel universe. Everything is the *same*, but *different*. Great story. Thank you Sherri, it seems to be a common discovery, I myself was a quite impressed by the decorations and music everywhere in the US. We decorated our yard in the US to fit into the spirit. besides the few cheap electric lights we draped over the bushes right in front of the house, we proceeded to make our own Christmas decorations in various colours and all glittery to hang in the trees. Somehow for Christmas my family did not take the American customs with us, but stayed with the German ones. Have a great English-American Christmas! What a fascinating post, comparing two quite different cultures! As an Australian with some German heritage, I loved reading it. Christmas lights on homes has become more popular here in the last 20 years and it’s now part of our family tradition to drive around our suburb to check out all the Christmas lights. While I personally like looking at the houses which have gone completely overboard, my personal taste is much more constrained. Where I grew up in a well-to-do area of Sydney, there are still very few houses with Christmas lights despite the affluence. I think they’re considered tacky. We have a fairly small Christmas tree every year. Since the kids were small, we’ve put the tree in a corner on top of a combustion heater out of reach. The kids are now older but we haven’t found an alternative spot and had trouble squeezing the tree in at all. We’ve been catching up on sorting out the house during the break.